Home > Finances > Will I Be Able to Get a Mortgage? For several years getting a mortgage in the UK appeared to be open to everyone. Whatever people’s employment status or credit history it seemed as if there was someone out there willing to lend money to fund a house purchase. Property prices kept going up and lenders felt secure in the knowledge that even very high loan-to-value mortgage deals were safe because the property could always be repossessed and sold off to pay back the loan. Towards the end of the boom many companies were offering loans for more than 100% of the property’s value on the basis that the property’s price would go up and the total amount of the loan would, in due course, be secured. For people with irregular incomes there was always the self-certification mortgage where very little was needed in the way of proof that the mortgage was, indeed, affordable. Fast forward a couple of years and everything has changed. The financial markets came to a near collapse. Many people have pointed the finger at “easy” credit as being one of the main culprits of the economic downturn. The property market stagnated – with some commentators still predicting a further drop in prices. Now that prices may be tantalisingly within reach for some of those who previously thought they’d never get a foot on the property ladder, the main concern is being able to find a mortgage. There are fewer mortgage products, and lenders, available but banks and mortgage companies are still out there - and they are still lending money. Whilst there may never be a return to the good/bad old days there are factors that make a difference when it comes to applying for a mortgage. Lenders will undoubtedly check the credit reports of anyone applying for a mortgage. Obviously, if things like defaults on credit payments or County Court Judgments show up, this is going to make a mortgage offer much less likely. Large balances on credit cards or unsecured loans will also be another warning sign, even if the borrower is not in default. There are other, less obvious, factors that a lender may take into account when deciding whether a potential customer is a safe bet. For example, a lender may be concerned about a borrower who appears to have a large amount of unused credit available to them. The risk is that, although not in debt now, the borrower could use up these credit allowances in the future making it more difficult for them to afford their mortgage repayments. 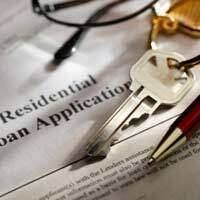 One type of mortgage that looks unlikely to return any time soon, other than in exceptional circumstances, is the very high loan-to-value mortgage. What this means is that banks and mortgage companies expect buyers to have the funds available for a substantial deposit. If the lender can see that the buyer is making a real financial commitment to the property themselves, they will feel more confident in lending the balance of the sale price. Naturally, a larger deposit also means that if the property is repossessed and sold, there is a much better chance that the lender will recoup their money - even in a market when prices may not rise. Lenders are likely to be looking for deposits of at least 10% of the property’s value. Those borrowers with larger deposits available may have access to the best deals – especially if they can also demonstrate a good, regular income. It is possible that the likelihood of getting a mortgage may also be affected by the type of property to be bought. For example, lenders may feel more confident lending on a well-built freehold property than on a leasehold property with a relatively short lease. New-build properties have been more susceptible to market fluctuations and, in some areas, have also been associated with much higher levels of mortgage fraud than other types of property. Some lenders have, therefore, become much more wary about offering a mortgage on a new-build. At the height of the financial crisis, those lenders who were prepared to offer mortgages on newly built property were demanding that borrowers had deposits of up to 50% of the property’s value. Similar criteria have also been applied by certain lenders to recently converted properties. Anyone thinking about buying a new-build property would be well advised to make sure they know exactly where they stand in relation to their finances before paying an on-the-spot deposit to reserve a property.